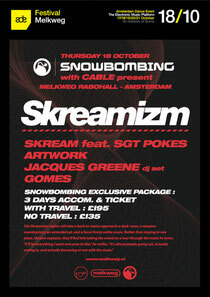 To mark the launch of Snowbombing 2013, the organisers have revealed they’ll be taking their show to one of the world’s best party destinations, Amsterdam! The Melkweg club will be taken over, in association with Cable, on Thursday October 18th as part of Amsterdam Dance Event (ADE). ADE welcomes the globe’s foremost DJs, promoters, festivals and agents coming together to discuss the latest news, projects and progressions in dance music, before turning Amsterdam into a colossal celebration of raving! This will form the first part of Snowbombing’s Global Launch Party Series, as they take their “World’s Greatest Show on Snow” on a whistle-stop tour of some of Europe’s best clubbing destinations. Forming the centrepiece of this one-off, exclusive shindig is the world premiere of Snowbombing resident and global megastar Skream’s new club project, entitled Skreamizm. The project will take a back-to-basics approach: A dark room, a massive sound-system, an extended set and a focus firmly on the music. DJ support comes in the form of Skream’s right hand man Artwork. One third of Magnet Man, Artwork is one of the pioneers of dubstep and has been a Snowboming regular for many years. Jacques Greene will be bringing his progressively deeper idea house music to the decks. At only 22 years of age the rising star has already worked on remixes for Katy B, Jimmy Edgar and Radiohead. Oi! Recordings very own Gomes will also be joining the stage. Famed for his energetic and tight sets Gomes will be playing in his own neck of the woods, Amsterdam. Attendees can also expect to hear exclusive news on the Snowbombing 2013 line-up and information on brand new additions, attractions and experiences set to hit Mayrhofen at Snowbombing 2013. There are a limited number of holiday deals available for Snowbombers who want to be part of the epic weekend. For ticket info, check out: www.snowbombing.com.